James Hullick is a lauded figure in the sonic experimental world, and his work The Fission-Fusion Whale, a “futuristic song-cycle” presented by the BOLT Ensemble, gave an insight into his unmistakably creative and warped mind. The synopsis is peculiar: a modern fairy-tale where three “god-like interstellar explorers” find one of their members engulfed by a “galactic whale”. 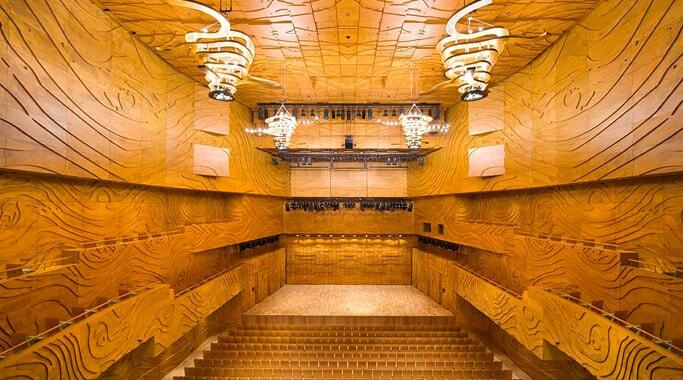 The stage set-up in the Salon at the Melbourne Recital Centre was visually excessive, bloated with a synthesiser, an open grand piano, a large percussion setup, speakers, an amplified aquarium filled with water and shells, and two mounted television screens. Part concert, part music theatre, part song cycle, the work opened with a young girl, played by Astrid Bolcskey-Hullick (James Hullick’s daughter) walking up to the amplified aquarium. She caressed the shells with her hands as the audience heard manipulated whale sounds through the speakers. In a pure voice, she then sang short syllables across a wide tessitura into a microphone. Justine Anderson (The Captain) entered with gusto, wearing an extravagant shell-crown while swiping two bells held in her hand with a metal stick. Her voice was operatic and unbridled, embellishing the simplicity of the young girl’s voice with her elaborate vocalisations. Percussionist Peter Neville (The Engineer) then entered, bellowing galactic-themed words such as “vortex” and “planet”. Strange James, the performance moniker for Hullick, played The Pilot and was the last to enter the space, sporting multicoloured face-paint and an archaic pilot’s hat. He joined the ensemble timbre by also bellowing in a dramatic and bizarre fashion, simultaneously waving his arms as though navigating a room without gravity. While these entrances were grabbing, the absurdity of the whole scene produced a few stifled giggles among audience members. The screen then read “Scene 2: The Pilot is sucked into a black hole”. Anderson established her role as the Captain through her arresting operatic vocals, accompanied by Neville’s considered and grounded drum strikes. Strange James filled out the timbre by playing low and rounded tones on a synthesiser, which were reminiscent of a whale-call. This somewhat ordered ensemble dynamic then spun out of control; electronic phone sounds and incoherent static voices were heard through the speakers, while the two men yelled in guttural trauma. The long and low synthesiser tones were replaced by manic embellishments in the upper-register. This section of the work also saw the introduction of the Duckworth Hullock Duo’s “Resonance Table”, a touch screen audiovisual instrument created by both Hullick and Jonathan Duckworth from RMIT University, programmed by Ross Eldridge for this performance (which you can learn more about here). Adding an interesting element to the chaos, the table was essentially a large black touch screen with four primary coloured rings on one side. Anderson dragged the rings to the centre of the board, and upon releasing her finger from the board, the ring exploded into an aura of colour, with various lines emanating from each ring. The board then pulsed with electronic currents and, depending on the position of the rings, these visual pulses translated into beeping sounds. The activity on this board was projected onto one of the television screens. While the sounds that emanated from the table were difficult to distinguish among the other electronic sounds, this visual element gave the audience something tangible to engage with in this convoluted and sonically elaborate scene. The chaos died down. Strange James moved to a prepared piano, and black and white visuals of a beach were played on a screen. The music was noticeably calmer, and a tape of a child’s voice telling a story was heard. Strange James had been catapulted to Earth and was infatuated by the child. The Captain aggressively confronts her Pilot as to why he would choose to remain on Earth instead of returning to the ship. The three characters then circle the grand piano with the lid open, both the Engineer and the Captain questioning the Pilot, the performers occasionally hitting the keys of the piano and the strings inside the piano as a means to project their frustrations. The child told an innocent tale about a “sticky beast”, accompanied by solemn chords played by Anderson on the synthesiser. Strange James then had a musical monologue on the prepared piano, reflecting on the “sticky beast” fairy-tale and his decision to remain on Earth with the child. The work finished with Justine reflecting on losing the Pilot in her own operatic monologue. Neville accompanied her by playing a volley of cymbals with musicality and conviction, the timbre of the cymbals providing a pleasant shimmer of sound underneath Anderson’s strident voice. Ultimately, the last offering to the audience was the phrase “I am that I am” on one of the screens, a candid ode to self and collective acceptance. 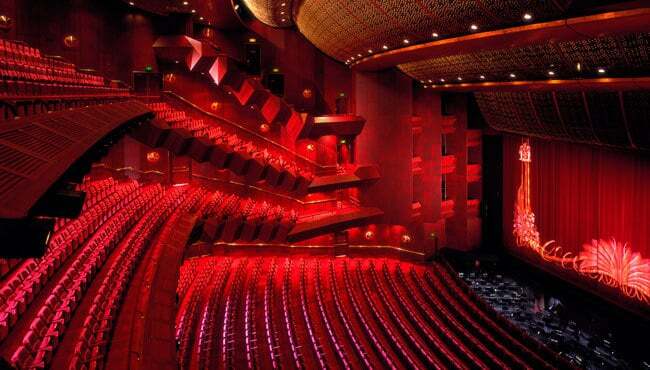 Afterwards, Hullick briefly spoke to the audience and said that the work will return in a different form; the fairy-tales within the work will change over time, and the performance will eventually be staged in a larger performance hall. While the storyline was unusual, the individual creative elements–from the musical composition to the methods of sonic experimentation–were the ultimate highlights of the work. Furthermore, the talents of Anderson and Neville as performers and proponents of their instruments were undeniable. Strange James, albeit strange, was also a captivating performer. The work felt undeniably childlike in its conception, but there was something quite beautiful about consuming an innocent story in a “high art” setting. It was exorbitant for the sake of it, but was still in jest of itself, and honoured the creativity or aptitude of the performers. While surely a divisive performance, it felt somewhat refreshing. Madi Chwasta reviewed The BOLT Ensemble’s performance at the Salon, Melbourne Recital Centre, on May 23, 2018.